Yes, there are already a few “update notifier” out there, but I couldn’t find one that would fit my needs (granted I didn’t search too hard, I was also interested in making my own as a fun exercice…) so I decided to make a new one. When system/AUR upgrades are available, notifications can include a button to start the system/AUR upgrades. You can specify the command line to be executed when the button is clicked. If you don't like it/the idea of a graphical system updater, and not using it isn't enough, you can use configure option --disable-updater and turn kalu into a notifier only. From v1.1.0 onwards, two command line options - --manual-checks (-m) and --auto-checks (-a) - allow to run manual/auto checks from command line. No GUI will be used at all, everything gets printed on stderr/stdout (using the same templates as for notifications). This can be done without the need for a DISPLAY/running X server (i.e. no GTK init performed), thus works from a tty or through SSH. This can also be useful to use kalu from scripts. With v1.2.0 it is now possible to have kalu re-show the last notifications. So if you missed them or forgot what it was about, one click will re-show all notifications instantly without the need to ran the checks again. And, somewhat similarly to what happens after a system upgrade using kalu's updater, you can now use variable $PACKAGES on the command line to perform AUR updates. Can be useful to start some helper/script to handle the update of those packages automatically for you. Also note that kalu's source code (and issue tracker) has been moved to a git repo (was mercurial before), and is now hosted on github. Thanks to Painless Rob for his great icons. Edit: Added info about recent changes/additions to latest version. Haven't taken a look at your source code, but if you're doing this by -Sy what happens when a user installs a package without -Su first? I can't find ~/.config/kalu/kalu.conf file as you said in your blog post.Did you move it? As I said, kalu creates temporary copies of your dbs and syncs them to do its check. So your dbs are not changed, but it can tell whether new packages would be available or not in the repos after a sync. No; But actually, you'll have to create it first, yes, as kalu only tries to read it when starting. If you added watched packages in 0.0.1 and it's still running, it might be a good idea to manually create the folder, then use "Manage watched packages" and save the list again, so things are actually saved. can you post me a default kalu.conf file? Sounds good, thanks. Not really keen on graphical package management but some others will be I'm sure. Yeah, and one can use kalu just to be notified, instead of having to do a -Syu every once in a while, but let pacman do the upgrade. hmm... what are the permissions for that file (/var/lib/pacman/sync/community-testing)? Specifically, can it be read? Any chance you're running out of space on your /tmp ? Hopefully this will resolve the problem, if not you can try running kalu from a console with --debug and see what it says. I have the above messages remaining even after I read the news. The AUR message changed from 2 packages updated to 1 package updated. How can I clear these? If you're not running the latest version (0.0.3) you should update, there was a little bug in early versions and news would not be marked read, even after you clicked the "Mark read" button. It should work fine now. As for the AUR, it simply checks the version installed on your system with the one in the AUR, so to clear it you need to update Of course afterwards you need to wait for kalu to check again (or use "Check for Updates") so that it can register the change. I am using version kalu 0.0.3-1 from AUR. Then let it do a check for updates so you have all the notifications, and for the news click "Show news" and then "Mark as read" Then let's see what the output say. Also, see your ~/.config/kalu/news.conf after that. I am away from my home machine right now. I will update my post in a few hours. OK - a quick report. The news does not appear to have a 'mark read' button. Ok; first of all: you don't need sudo, kalu works fine/should be run under your user account, no need to give it root privileges. 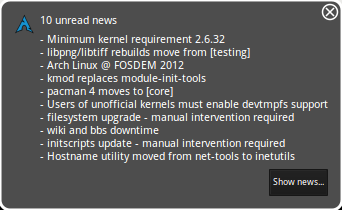 For the news: it looks like you didn't click the "Show news" button from the notification, but instead used the "Show recent Arch Linux news" menu? The menu always shows you all the latest news, and the window then doesn't have a "Mark as read" button indeed. You need to click the button "Show news" from the notification, then only unread news will be shown, each news title will have a checkbox before it (checked by default), and the window a "Mark as read" button. As for the AUR, it seems that you have pacmanxg4-bin 4.7-2 installed on your system, while in the AUR v4.8-1 is available. OK - AUR sorted - I missed that package! Forgive my stupidity but where is the "Show news" button? Its right there.The third option in your image.When you click it, it opens a new window and it works for me. Sorry, but I do not have a "Show news" button on the notification. No, on your first post this is the tooltip, that shows up when you put your mouse over kalu's icon. But notifications should show up after a check when there's something new.